Keeping safe on any job is a joint effort. Everyone onsite is responsible for themselves as well as the safety of others. Some job positions are inherently more hazardous than others so they are governed by certain rules, guidelines, procedures and laws. 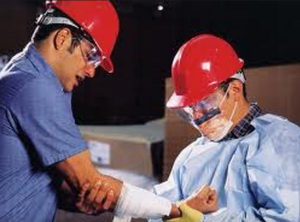 All of which have been been established OSHA (Occupational Safety Health Administration). According to these guidelines, the management team in the company has the responsibility of ensuring everyone is provided with the training that they need to keep safe. In fact, safety training courses and other required information must be offered based on the type of job position that the employee is performing. For instance, employees who work in silos, vaults, manholes and tanks should receive confined space training. According to the United States Bureau of Labor Statistics home page, there were 2,986,500 total recordable injuries in 2011. While most of these injuries did not require loss in days worked, approximately 908,000 of these cases resulted in employees missing days. Slips, falls, trips, sprain, strains are all part of recordable injuries that OSHA tracks. To prevent and reduce these numbers, a wide variety of different valuable rules and guidelines have been established. Since employee safety is a joint effort here are six tips that you should use to protect yourself from injury on the job. Sometimes employees may not understand why there are so many different safety signs posted around the workplace until they hurt themselves. Safety signs that display specific pictures and verbiage are there to keep everyone in these areas safe and free from injury. While these signs may appear to be optional, they are not since OSHA guidelines require specific signs to be placed in certain areas. For instance, if someone spills water on the floor, the person who is responsible or others nearby must place a slip/fall caution sign near the area. These signs will help to prevent others from fallings. Don’t drink and work should be a staple in any every employee’s work life rules. Unfortunately, this rule is not always followed because some employees like to party all night and then go to work in the morning. Unfortunately, these actions can be described as an accident waiting to happen since employees must be alert all times. Even in the jobs that may not be considered high injury risk areas, employees may be injured by the actions of someone else. Specifically, those who are more prone to make a dangerous error in judgment. Ear plugs, safety shoes, goggles and other protective wear are all worn for specific reasons. Trying to work without them can cause irreparable harm. For instance, if the individual walks into a high-risk area without the appropriate safety shoes, they are at risks of losing toes or sustaining broken bones in their feet. Safety is a joint effort for everyone on the premises. Consequently, when any individual sees potential hazards around the workplace, it should be reported to management or to a safety specialist. By reporting the information, the individual can prevent others as well as themselves from sustaining an avoidable injury. Employees who work with different kinds of heavy equipment are usually required to receive specific training for the equipment. Sometimes management may require another employee to cover for others when they are out. Before handling new equipment, the employee should always ensure that they have the required training for the machinery that they use. Therefore, if the manager does not offer it, the employee should ask for it in advance. Sometimes employees are required to take all kinds of training courses when they enter into a new job position. While some of these courses may be redundant, others are crucial to the success and the safety of the individual. This is true for all safety related training since it involves remaining safe and knowing what to do in case of an emergency situation. In fact, people who are well-informed are normally the ones who save lives since they know how to respond quickly with the knowledge that they have learned. Safety is a joint effort for all involved. Adhering to all of the safety rules and guidelines is one of the best ways to stay safe. Reporting hazards, asking for the appropriate safety training and abiding by the safety signs are all a part of protecting yourself from injury on the job.